The stars behind the biggest films of the year like Prabhas, Aamir Khan and Shah Rukh Khan may have been absent, but IIFA was quite an extravaganza. P Rajendran reports for Rediff.com from New Jersey. Director Zoya Akthar had said in an interview that she could not put the most over-the-top stuff she saw in Bollywood into her film. 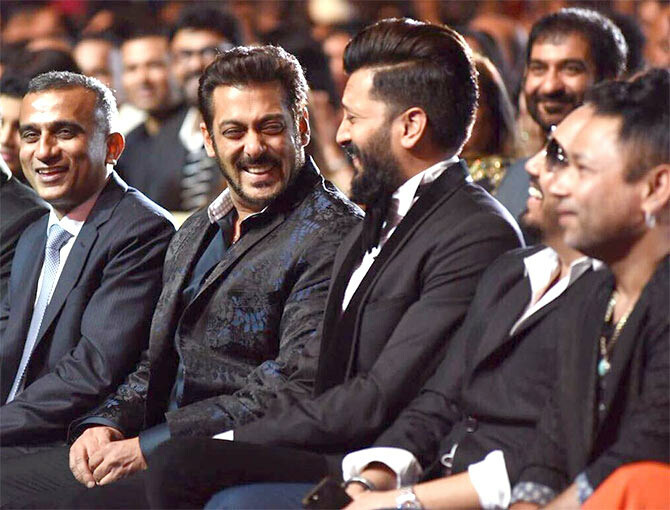 But the audience got a glimpse of that at the International Indian Film Academy Awards (IIFA) held at the Metlife Stadium in Secaucus, New Jersey, July 16. The evening began an hour fashionably late with a deep, portentous voice, that of voice-over artist Siddharth Kannan, saying, 'Hello, New York' -- while the nearest New York shore lay five miles away as the crow flies. The charade, possibly aimed at an offshore television audience, continued awhile until, perhaps pressure from the local people got those on stage to mention New Jersey too. 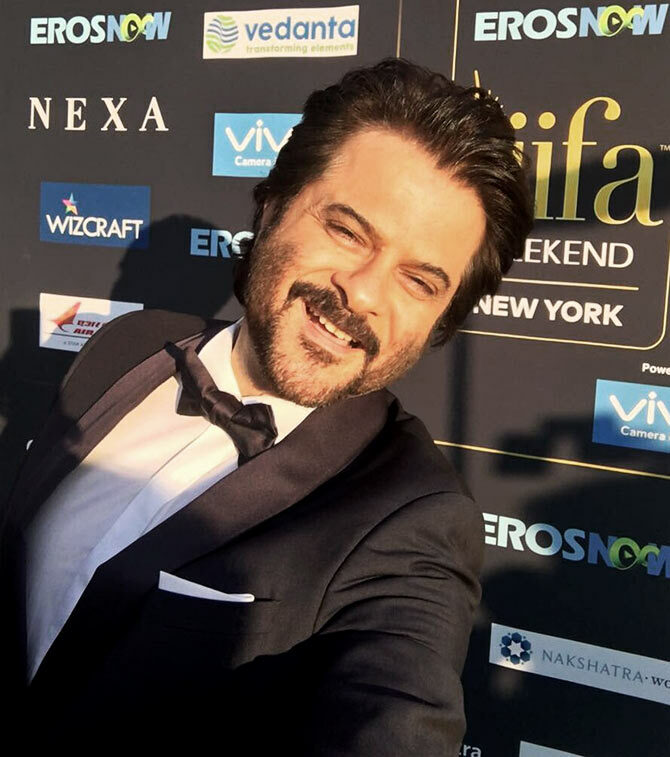 Anil Kapoor came up first, to pump up a crowd that filled half the stadium and the members of which appeared all willing to let their hair down given the chance. Fireflies of wavering smartphones taking pictures speckled the dark stadium. 'But the stars come out when it's pitch dark,' he continued, adding that he was akin to the newsreels that used to precede a film in India when the ambassador was growing up in New Delhi. After that official imprimatur, the emcees -- Saif Ali Khan and Karan Johar -- came up and quickly got around to trading funny jabs at each other, describing each other as 'nawab for some reason' (Khan) and 'director for some reason' (Johar). They called on stage one Ronald Rump, an amalgam of the American president and McDonald's Ronald the clown, who did a bad imitation of Donald Trump and then broke out into Mere Desh Ki Dharti. To put it kindly, that was interesting though McDonalds was one of the sponsors. There were the obligatory dances. 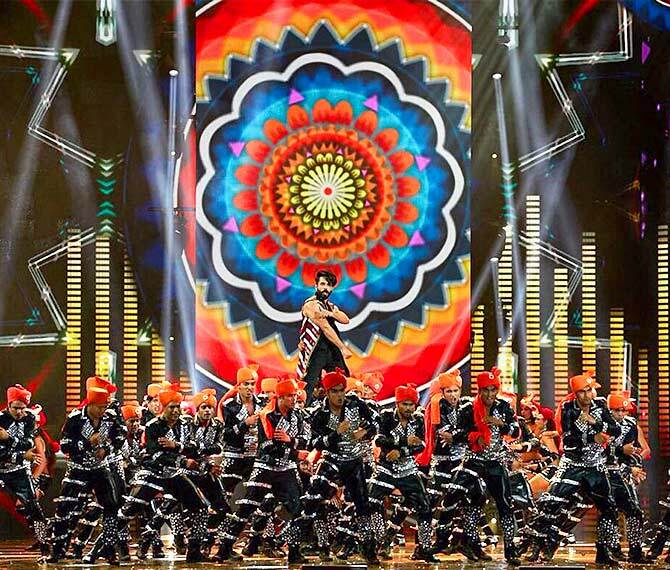 Alia Bhatt had dancers clad in neon lights. Katrina Kaif had a troupe wearing gold suits and, at times, motorcycle helmets. Kriti Sanon and Sushant Singh Rajput danced with a group, wearing bright neon -- the women wearing ruffled skirts and the men silver-speckled black pants. Shahid Kapoor danced with guys in sober black, their fronts covered with silver sequins. The emcees' attempts at forced gaiety were relentless. Remarkably humorous allusions were made to people's lack of talent or dress sense, the latter including the description of an actor in a white hoodie as reminiscent of a condom, the point being belaboured with an explanation of what one can do -- except for his significant other. When the Best Comedy film award was announced, the prime joke was about the medical conditions described in various songs -- these including urinary infection, constipation and diarrhea. Before some the younger winners left, in what appeared to be staged efforts, they asked Johar (or 'Karan sir') for roles in his next ventures. In return for the metaphorical genuflection, he refused. Ritual humiliation is, of course, incredibly funny and very good to toughen people up. Ask some of those juniors at professional Indians colleges, some of whom may have died laughing. Oh, there were inside jokes too. 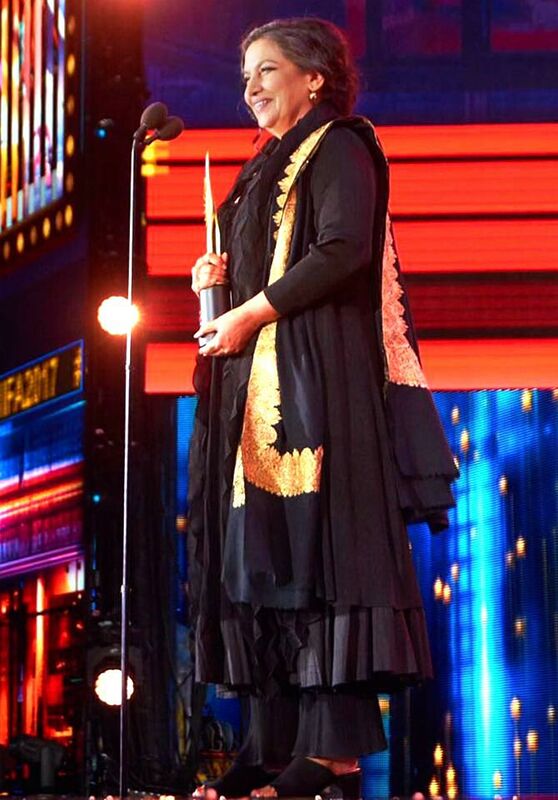 When Varun Dhawan came up for his award, he was informed he was there because of his father (director David Dhawan). Whereupon he retorted that Khan was there because of his mother (Sharmila Tagore, the star of the 1960s and early 1970s). The reference was to Kangana Ranaut's complaint on Koffee with Karan, the television show hosted by Johar, about what determines success in Bollywood. Khan and Varun also sang Bole Chudiyaan Bole Kangana. If anyone had still not got it, Johar pushed the point by saying that it would have been better if they had not said 'Kangana'. 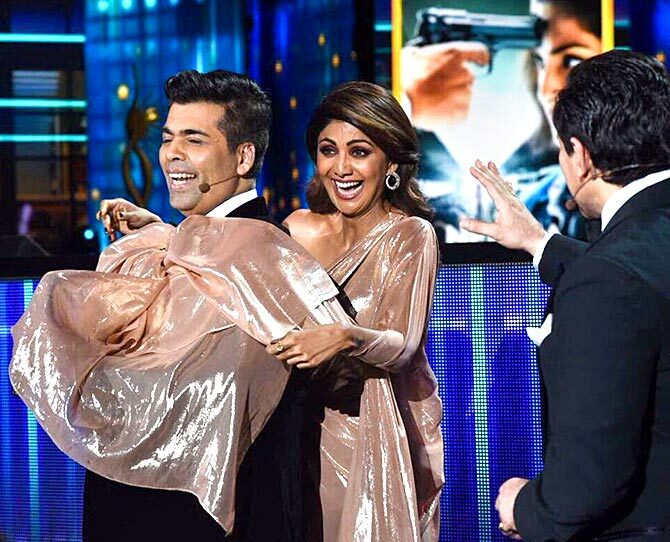 Shilpa Shetty held forth on gender equality and described all the men in her life, who had given her the respect she deserved. But she also good-humoredly allowed roving emcee Manish Paul to lavishly praise her figure and, alluding to her husband's curled up moustache, say it was but natural that it stood erect. Paul also convinced her to climb over the chair before her to show how a yoga asana ought to be done. When she did, he expressed mock anguish and envy for the lucky chair, and went on to deliver a few more leering comments. While making cracks about Neha Dhupia's wide skirt, Paul suggested that someone could live in it. All of this in good humour, of course. The main emcees were also not averse to sexual innuendo. True, this year's IIFA was a trifle disorganised, as emcees tramping from one designated position to the other provided moments of blessed quiet -- unintentionally perhaps. Did we say it was loud, too? Well, it was -- metaphorically and acoustically. Shut a ear, turn the other way, and the volume dropped to what might be expected at an Indian concert. Take it all in unfiltered, and the assault could stun one into helpless, inchoate jelly. By 2 am, the audience was incapable of a suitable response, as Sonakshi Sinha discovered when she repeatedly tried to get them to join her in a song. This, when pushing Nand Ghar, an effort to help poor women and children in India that the crowd clearly supported. 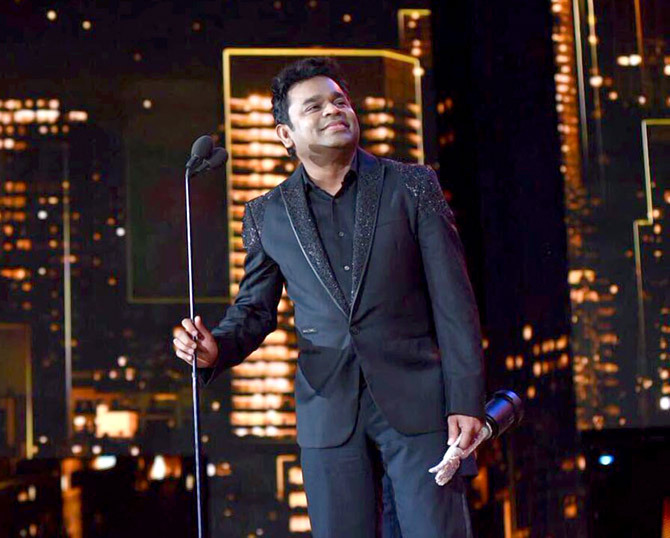 There were a few moments of sincere modesty when A R Rahman came up for his award and, while thanking the audience, asked them to forgive him for some of his less memorable work. Or when Shabana Azmi said, 'Acting is a collaborative effort' and then spoke of the unknown people, who fix her acting errors, making her performance look better than it is. Or again, when award-winning lyricist Amitabh Bhattacharya sang a song he wrote for Ae Dil Hai Mushkil with quiet emotion. Rajat Kapoor, the director of the understated Ankhon Dekhi, was present, but as a nominee for Best Supporting Actor and lost out to Anupam Kher. Crowd favourite Salman Khan was also present.